To get started, please choose a product from the list below. Any books in PDF format, from biography, cookbooks, yearbook, children's book, to reference book, religious books, etc. Sizes Start at 5.5" x 8.5"
Sizes: 12" x 9" or 12"x18"
Size starts: 5.5" x 8.5"
Publishing your book with PhotoGalley is as easy as 123! 1. Upload your photos 2. Choose a template and design 3. Publish! Choose from our many publishing options like our free online book publishing and share your book with your friends and/or our entire community. Publish your book, photo book or photo cookbook with our easy to use online design software starting with 1 printed copy and 100's of publishing options to choose from. 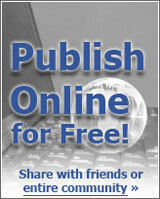 Or submit your camera ready PDF and publish from 25 to 25,000 copies, at the lowest book printing prices in the industry. With over 100 years in the book publishing industry and nearly unlimited printing options, PhotoGalley.com is your one stop print shop for all your printing needs.